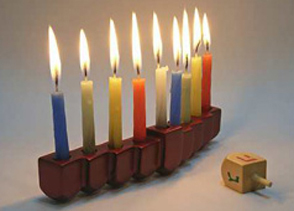 Beyond the candles and the doughnuts, the Hanukah story itself offers us a striking conflict. The book of the Maccabees describes a bitter civil war between the Jews of the Holy Land. Accommodationist, assimilationist Hellenist Jews, fans of globalization and openness to other cultures were ranged against the Maccabee Jews: zealous, isolationist, ethnocentrist and devout. Through violence, intimidation, and divine assistance, the Maccabees won the historical battle while the Temple was sacked. Some may say that a similar conflict is raging among the Jewish People throughout the world today. The two polarized camps of believers in liberty on the one hand and advocates of loyalty on the other hand are growing, gradually filling up the nuanced middle ground between them. In Britain, Jewish leaders are either praised or condemned for their public critique of Israel. Hecklers of the Prime Minister’s speech at the General Assembly in New Orleans are both disruptive and disdained. In Israel rumblings for and against loyalty oaths continue. As we light our candles this year may we spare a prayer for the nuance of the middle ground, where a paradigm of critical loyalty may hold sway. There is, after all, not one light of Hanukah, but rather an ever-growing number of candles, all flickering in their individual fragility.